This recipe for feijoa paste comes from the April 2011 edition of the New Zealand House & Garden and is another great recipe for anyone who is faced with a glut of feijoas. It has been featured in Stack of Recipes where the chef describes it as a foolproof recipe and recommended serving it with tangy cheese and freshly baked oat cakes. I also really like the sound of the second preserving option given below – little squares of fruity goodness dusted with icing sugar. Use a potato peeler to remove skin from feijoas. Roughly chop fruit and weigh: you need 300g of sugar per 500g of fruit. Put feijoa peel and cores and roughly chopped apples into a pan; barely cover with water. Cook until soft and mushy, about 10 minutes. Strain through a fine sieve, pressing firmly to get all the liquid from the apple. In a large heavy bottomed pot cook chopped feijoas in this liquid until soft. Push through a sieve or mash. Add sugar to the feijoa pulp; stir until dissolved. Cook slowly on the lowest heat, stirring every 2-3 minutes until thick. This will take about 3hrs – when it’s ready the spoon should start to meet resistance and the mixture will start to come away from the sides. Pour while hot into straight sided sterilised jars and seal with lids. *As an alternative, line a straight-sided flat dish with baking paper. Pour in mixture and smooth over with a knife. Give the dish a couple of taps on the bench to settle the paste. Leave to set for 2-3 days in a warm dry place, then cut into cubes when cold and firm. Dust cubes with icing sugar and pack in a tin or jar, or place in a box lined with waxed paper, with the added sifted icing sugar. My journeys around the Internet take me to some truly glorious food blogs, created by passionate and gifted cooks, stylists, photographers and writers. One I keep coming back to – transfixed by her beautiful images – is Gourmet Recipes by Olga. She doesn’t have an ‘about page’… just exquisite recipe after exquisite recipe. The cakes are divine artworks and her recipe for feijoa and passionfruit jam has been adopted as a family favourite. Do take a look around her site: she has a companion recipe for feijoa, pear and white wine jam along with the chocolate, feijoa and banana bundt cake featured here a while back, and also little chocolate cakes with feijoa mousse. Every photograph is wonderfully styled. Scoop out the pulp from the feijoas. Put pulp into a pot and add water. Boil on medium heat until the pulp is soft (about 15 minutes). Stir occasionally. Use a potato masher to gently mash the fruit. Add sugar, passion fruit pulp with seeds and stir until dissolved. Bring to a rapid boil and continue to boil for about 20 minutes or until the mix reaches setting point, giving it the occasional stir. Add vodka and stir to mix. Pour into sterilized jars, seal and store in a cool place. I only ever recall slathering lemon curd over toast etc as a child and I imagine that I would love a feijoa-flavoured spread of this kind just as much. This recipe comes from Group Recipes, another of those wonderful online communities where home cooks passionately share secrets of the kitchen and the table. Scoop out the flesh of the feijoas and blitz until smooth. 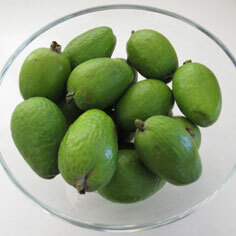 Into a bowl and using a spatula, push the smooth feijoa flesh through a sieve. Remember to scrape the feijoa on the underside of the sieve into the bowl. In a separate bowl, beat together the eggs, yolks, and sugar. Over a low heat, melt the butter in a medium-sized saucepan. If you are increasing the quantity, you may want to use a wider pan in order to speed up the setting of the curd. Stir in the feijoa and the egg and sugar mixture. Whisk constantly over a low heat until it has come together and has thickened, almost like custard. This took me approximately 15 minutes. Do not stop whisking as you do not want to cook the eggs. Pour the curd into a bowl and cover once cooled. It can then be refrigerated or used immediately. Stack of Recipes Forums has a number of threads dedicated to feijoa recipes. They can be a bit hard to navigate around, with all the bump entries and such but are worth a good search for some recipe gems. Chop the peeled feijoas. Place in a food processor and pulp well. Place pulped feijoas in a large glass bowl with the sugar, lemon juice, fresh grated ginger and water. Use a very large bowl or it overflows! Microwave on high for 5 minutes, then stir. Cook for another 10 minutes, stirring once, then pour into jars and seal. Be careful getting the bowl out of the microwave as it will be very hot. Another recipe for a feijoa jam, this time paired with aromatic cardomom. This one is devised by Amanda Laird of the New Zealand Herald’s Viva magazine. Boil ingredients for 40 minutes or until fruit is soft and pulpy, remove cardamom pods then pour jam into sterilised jars. Serve with fruit toast, sourdough or Vogel’s bread, toasted and buttered. I found this recipe in the archives of the New Zealand Listener website, which hides a treasure trove of distinctively New Zealand flavours. This jam is created by popular food writer Lois Daish, but the page has other great suggestions to use up many other fruits of autum. Of course I am in the mood for feijoa and feijoa only. That’s just the way it is this time of year round here. Roughly slice the feijoas. Put in a pot with the water and simmer until very tender. Mash with a potato masher, then add the sugar and bring slowly to the boil. Boil hard for a few minutes until the last few drops dripped from a metal spoon start to set. Pour into 3 small sterilised jars. Slice up about a dozen ripe feijoas, skins and all. Add just enough water to cover. Boil ’til feijoas are soft, then shake through a sieve (do not squash). Add an equal amount of sugar (cup for cup). Boil quite fast, uncovered, window open! Add juice of 1 or 2 lemons or a good pinch of citric acid and lemon juice. Test on a teaspoon. If liquid gels when cold and the jelly wrinkles when you run your finger across it, it is ready to be put in jars. Good with crackers and cheese. I found this recipe on Facebook but it originates from the Viva section of the New Zealand Herald. After a lengthy browse through the recipe archives online, I can finally admit that Amanda Laird is rapidly becoming my favourite feijoa chef – her recipes are so fresh sounding and she makes such exquisite flavour pairings. I simply cannot wait to try this jam. Peel and slice feijoas. Put into saucepan or preserving pan with the sugar. Peel and finely chip ginger and add with the water and lemon. Bring to a simmer and cook until the fruit is soft, then increase the temperature and boil for 10 minutes. Remove the vanilla pod, then pour into sterilised jars and seal. A friend dropped this recipe around to me the other day. It originally comes from the O-What-A Cookbook by the Owhata Women’s Hockey Club (Owhata is near Rotorua in New Zealand). Apparently it’s super quick and easy – and a firm favourite. But I am thinking seriously about it. I bought all of 16 feijoas this season before they disappeared (and my lovely wee boy ate more than half of them – he loves them too!) Then we skipped home for a very short break and my Dad’s little hedge was fruiting, he had bags of fruit given to him and roadside sellers had big bags for $3. In heaven, I say. Heaven. Because the honest truth is that at $1.50-$2 a pop here in Australia, there will be no jam making. Update: I’m enjoying this beautiful jam right now (autumn 2012) and we’ve added the Jamsetta (available from Woolworths) to the recipe as an extra precaution to aid setting. While feijoas are high in pectin, there is nothing as disheartening as jam that goes wrong. We’ve all been there, sadly, but if you are sure of your technique then feel free to leave it out. Do not peel the feijoas. Cut into thin slices. Add the water to the feijoas. Cook until soft. Gradually add the sugar, stirring constantly. Add the Jamsetta if using. Carefully bring to the boil still stirring. Bring to a fast rolling boil until it sets when tested. Feijoa jam sets quickly so watch it carefully. This recipe is great for when you have too many feijoas and you want to preserve them for use all year round (but in all honesty no-one really expects them to last that long). This recipe was found at New Zealand Cuisine. Place all the ingredients except the feijoas in a large pot and bring to the boil. With a sharp knife remove the skin of the feijoas. Place them into the sugar syrup and allow the mixture to come to the boil again. The fruit can then be bottled in jars that have been sterilised in the oven for at least 30 minutes at 120°C (don’t forget the lids). Conversely, the fruit can be stored in the refrigerator (after allowing them to cool first) and they last weeks.